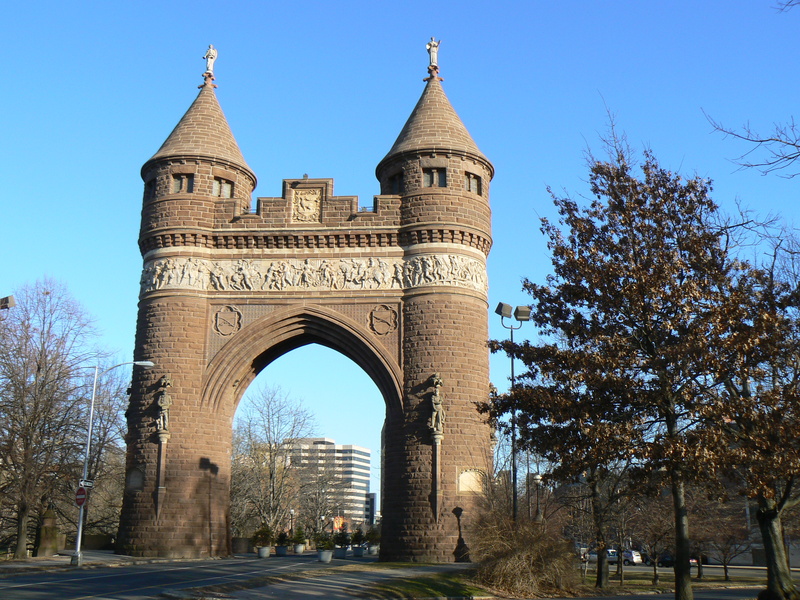 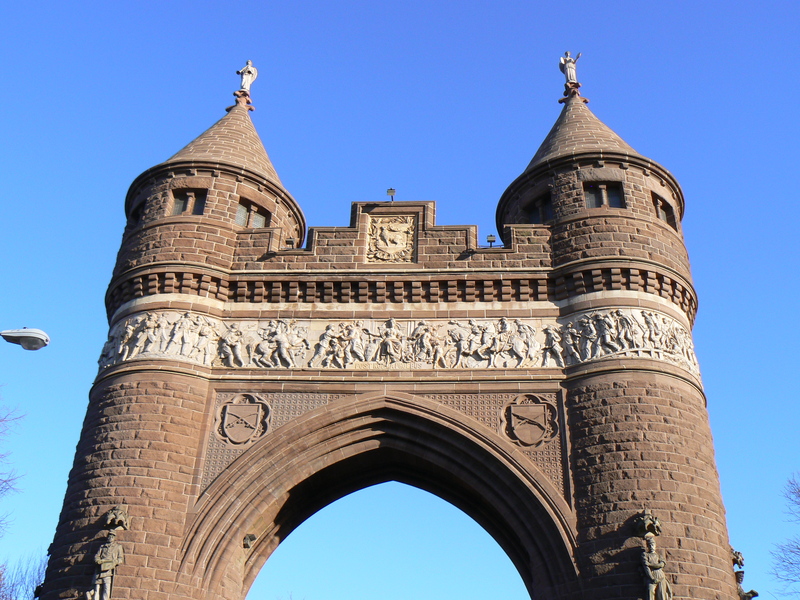 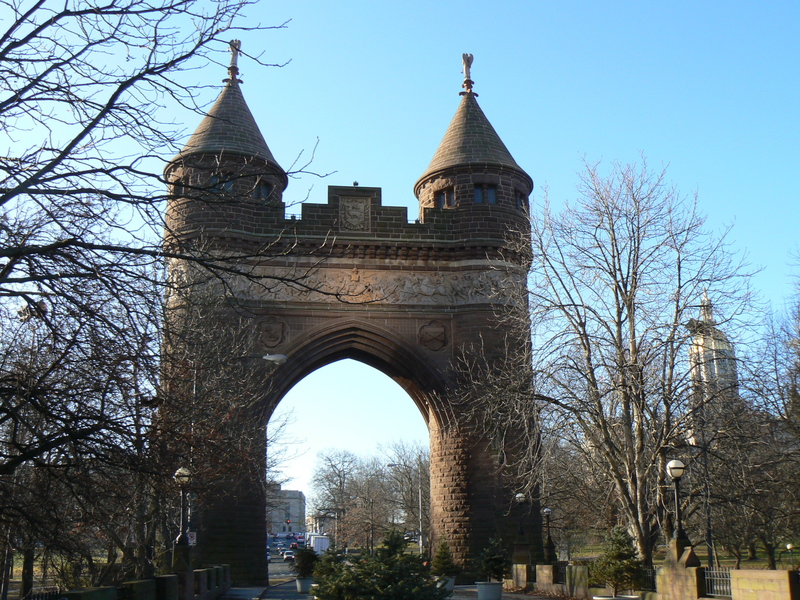 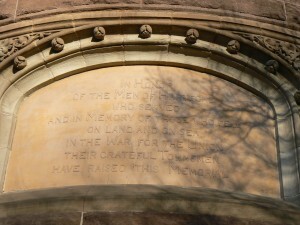 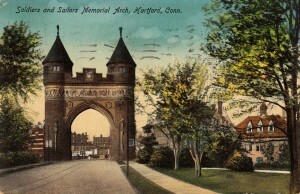 A Bushnell Park archway with two towers and a life-sized frieze honors Hartford’s Civil War veterans. The monument is dominated by the frieze depicting a variety of scenes that took place during and after the war. 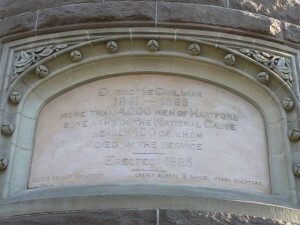 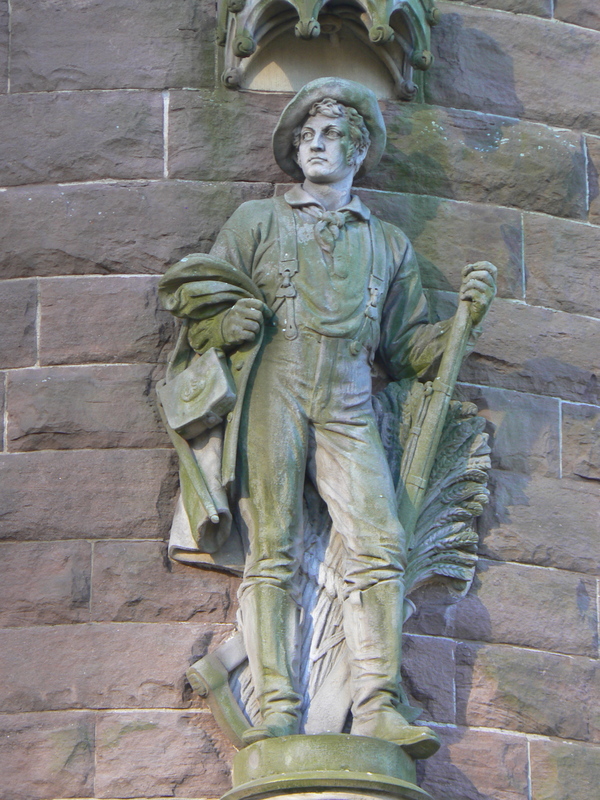 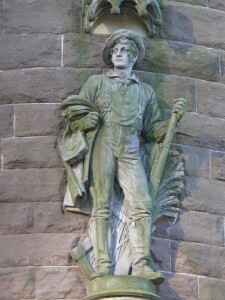 The south frieze, by sculptor Caspar Buberl, illustrates the return of Hartford’s soldiers after the war. 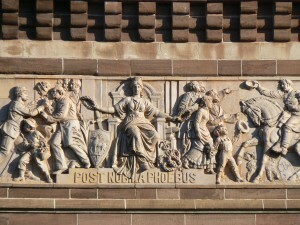 On the eastern (your right) side of the frieze, soldiers and sailors are leaving a ship and are being greeted by family members throughout the scene. 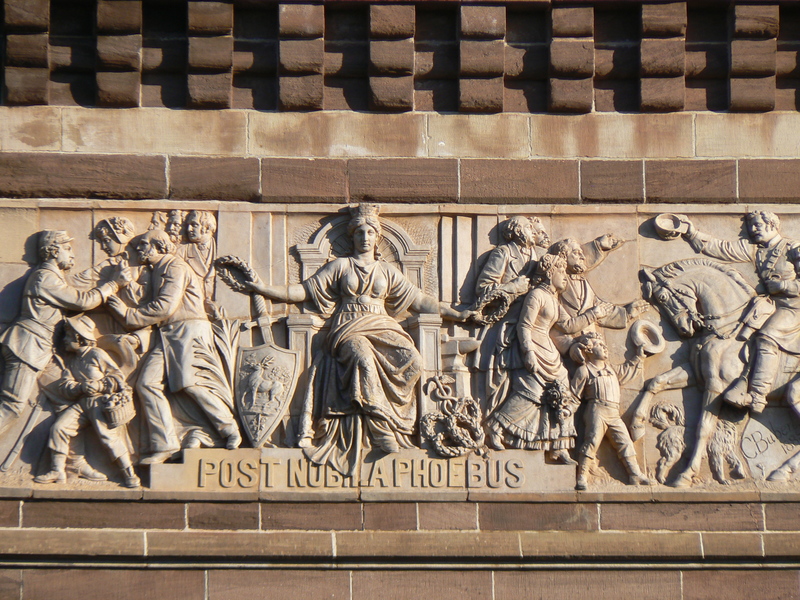 The allegorical figure in the center of the scene represents Hartford. 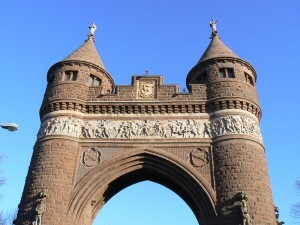 At her feet, the arch is inscribed with the city’s Latin motto, post nubila phoebus, which translates as “after clouds, the sun.” The motto also reflects joy and optimism following the dark days of the Civil War. 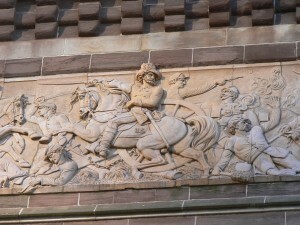 The north frieze, by sculptor Samuel Kitson, depicts battle scenes from the war. 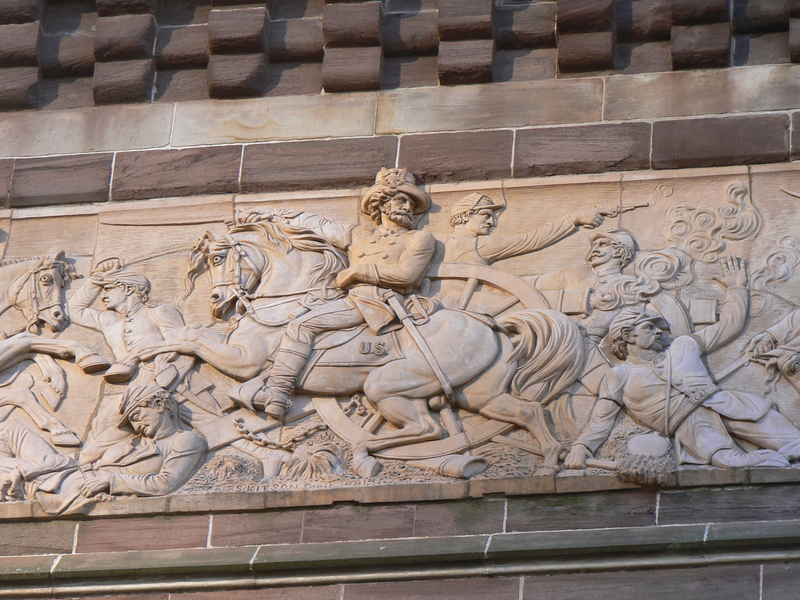 Ulysses S. Grant is depicted on the far right side of the frieze. 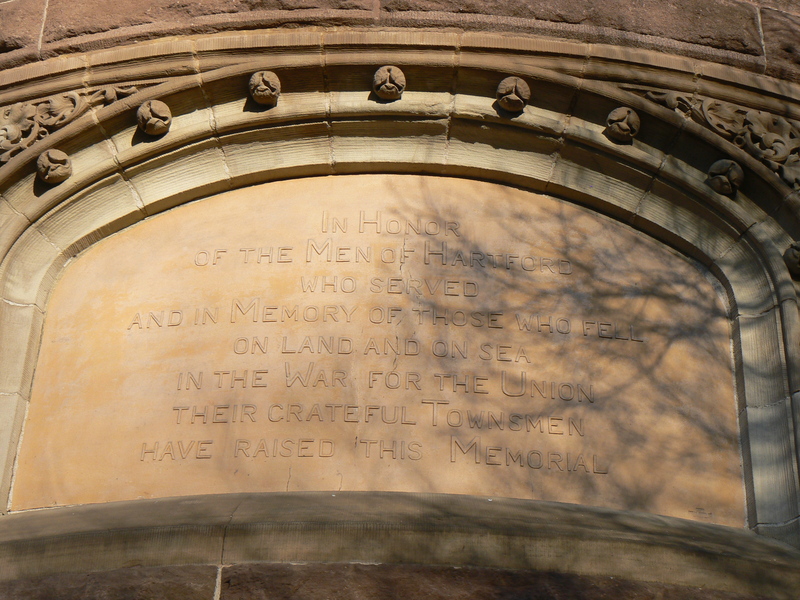 Just below the friezes, decorative elements honor the infantry (crossed rifles) and cavalry (crossed swords) on the south side, and the Navy (the admittedly obvious anchor) and the artillery service (crossed cannons) on the north side. 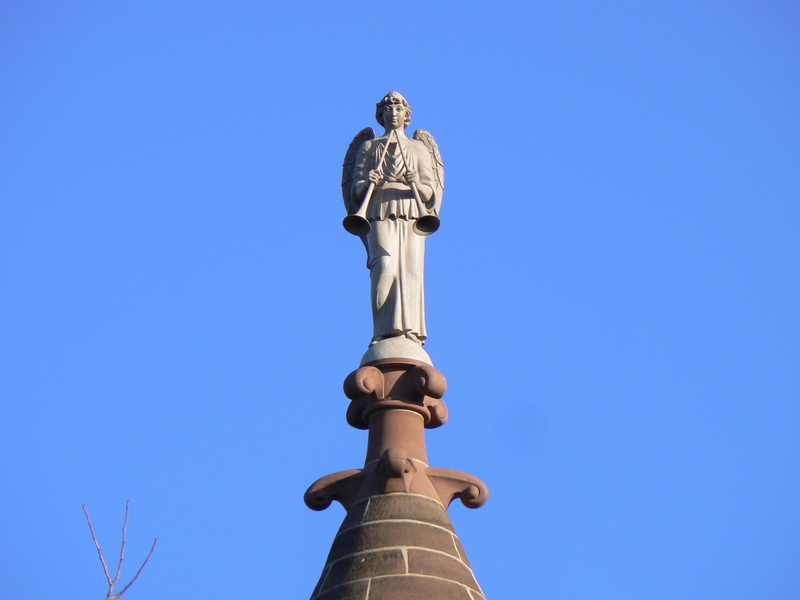 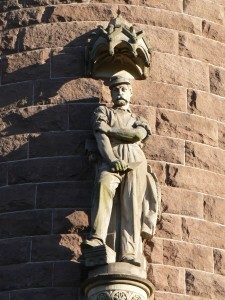 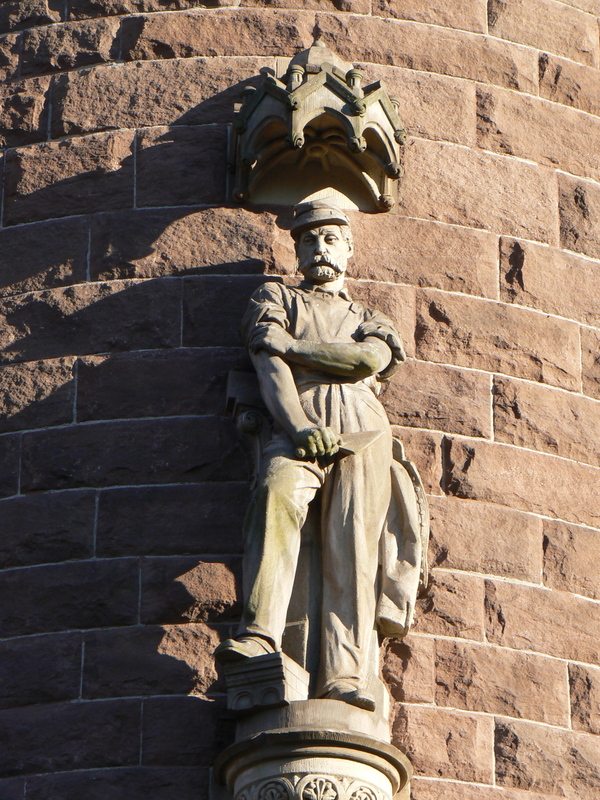 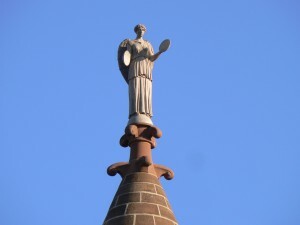 The two turrets are also decorated with six figures representing the variety of occupations Connecticut’s veterans left behind as they ventured south to fight in the Civil War, and are topped with angels providing a musical accompaniment to the return of Hartford’s soldiers. 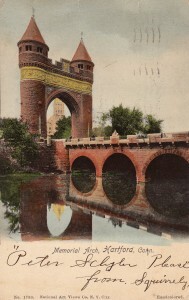 As you can see in the vintage postcards near the bottom of this post, the monument originally stood at the southern end of a bridge over the Park River. The river was diverted underground during the 1940s, but the bridge parapets can be seen just north of the archway. 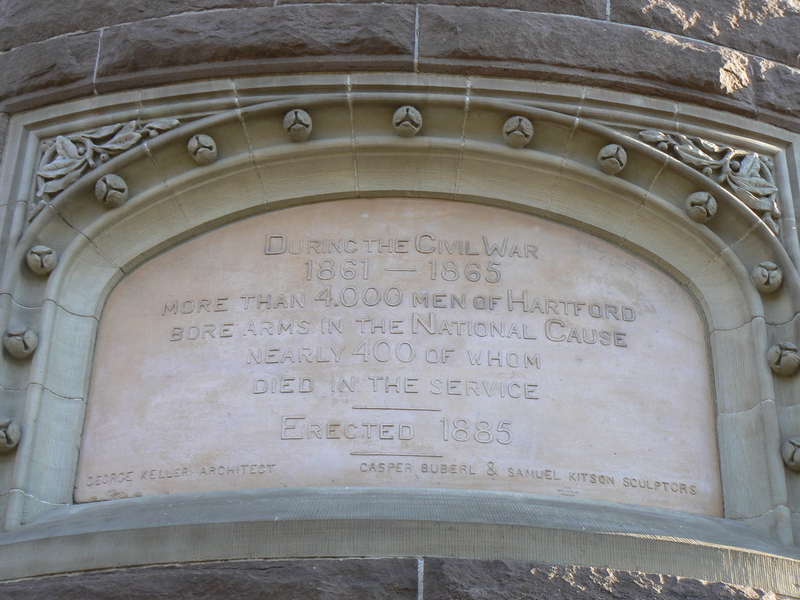 The monument underwent an extensive renovation in 1988, during which a plaque was attached to the west tower to honor the contributions of African American soldiers in the Civil War. In addition, the terra cotta angels atop the two towers were replaced with bronze replicas. 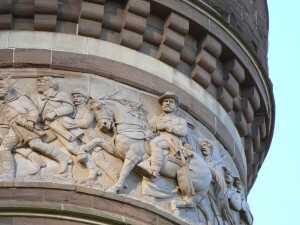 The monument was designed by George Keller, a leading memorial architect who also created the Soldiers’ National Monument in Gettysburg as well as the U.S. 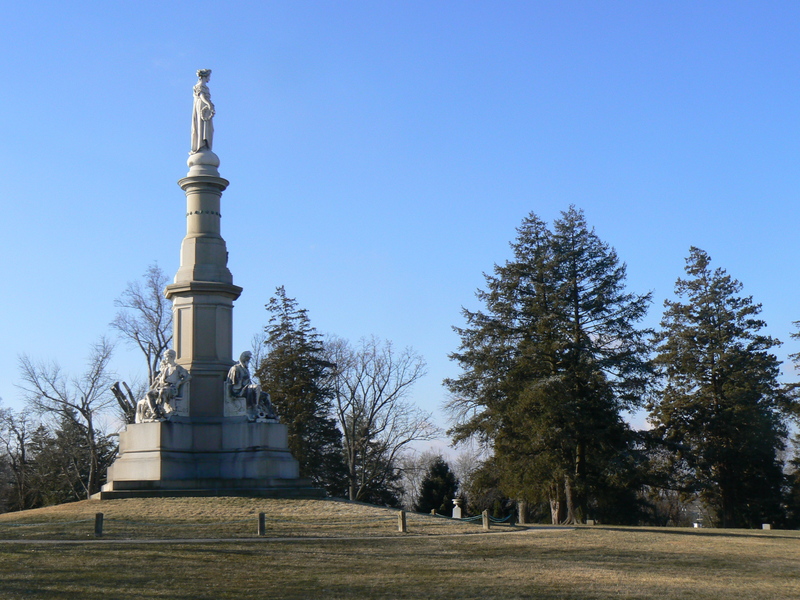 Soldier Monument at Antietam. 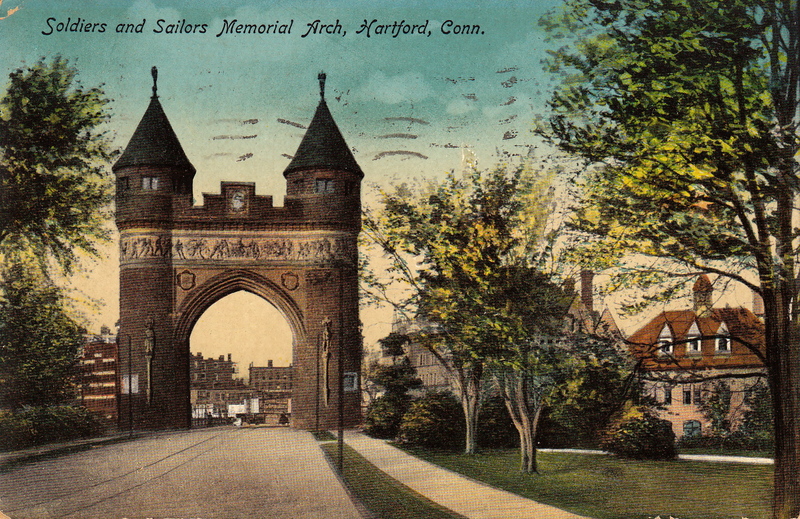 After his death in 1935, the cremated remains of Keller and his wife, Mary, were interred in the arch’s east tower.